Managing indoor air quality is of increasing importance in our modern day energy efficient and air conditioned environment. Black Mold and chemical off gassing are two of the major contaminates of concern today. Restoration of air quality is accomplished by eliminating the contamination through chemical action, manual removal of the suspect material and mechanical cleaning of the area. Proper decontamination will make the site available for restoration and normal use again. One of our most common remedial treatment projects is mold removal from residential, commercial and institutional buildings. At your direction or that of your consultant, our technicians will isolate the area and treat the organism with an approved fungicide. The contaminated material will be encapsulated, removed and disposed of in accordance with current standard mold decontamination practices and environmental regulations. We will then remove our isolation barriers and leave a clean site for your restoration contractor. Molds produce tiny spores to reproduce. Mold spores waft through the indoor and outdoor air continually. When mold spores land on a damp spot indoors, they may begin growing and digesting whatever they are growing on in order to survive. Here at A.E. 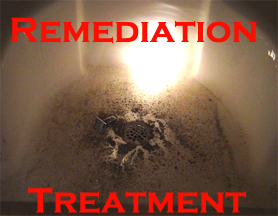 we provide the right chemicals to kill the mold in less than ten minutes.